It’s Raining Families: join futureplaces for a family portrait this Saturday. futureplaces is looking for 50 families of all shapes, sizes, colors, sexual orientations, ages. Your family can be your family, sure, but it can also be your music band, your circle of trusted friends, yourself. 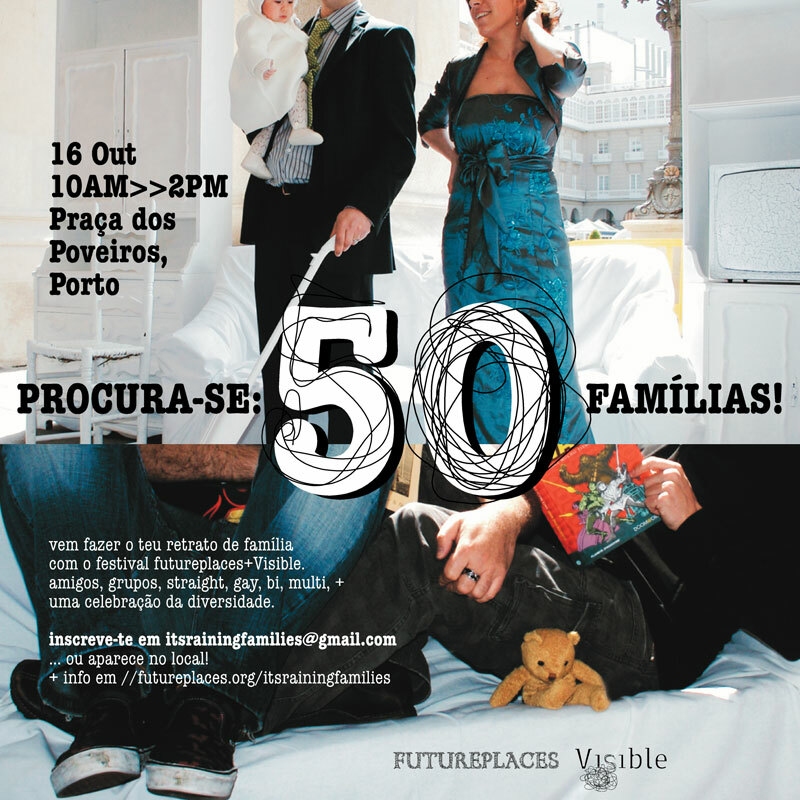 Come have your family portrait made by Pablo Peinado and Abajo Izquierdo at futureplaces: Saturday, Oct 16, 10AM onwards, at Praça dos Poveiros, Porto. Photography, food, fun and music. Later you will receive a copy of your portrait. + info here. Register via email itsrainingfamilies [at] gmail [dot] com or facebook. “We live in a diverse and complex world, and families are a reflection of this world: nowadays we have an astonishing diversity of family and relationship models, a diversity that was unthinkable in the past. Our social and political systems make it possible for each person to build their own life according to their wishes, in a continuous search for happiness and personal fulfillment. It’s Raining Families proposes to reflect this search process by presenting and celebrating this diversity of family structures. An ocean of relationships that Porto can reveal, and which will translate in the future in the shape of an exhibition and a participatory website where people can tell their stories, their narratives, their ideas.